instrumentation. PUMA’s unique client/server architecture provides unparalleled capability to automate test functions within the test laboratory. PUMA can monitor and control testing from across a local area network or the Internet. 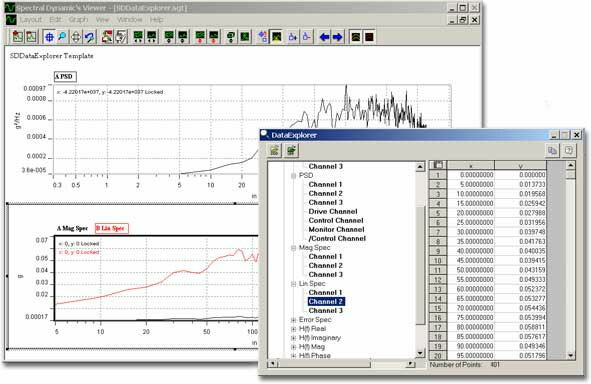 The ActiveX Automation toolkit allows users to customize their vibration control and data acquisition using Visual Basic, C++, or National Instruments LabView™. Mission Simulation allows the user to automate a schedule of predefined tests, offering a rigorous and continuous testing schedule with no user intervention required. DataExplorer provides a link between CATS powerful data analysis and report generation capabilities and other test and analysis systems. DataExplorer can import data from any system that writes to Universal File Format (UFF) Type 58, including finite element analysis and modal analysis systems. Time and frequency data of different sample rates and bandwidths may be overlaid and compared on the same graph. The user can also display, cursor, and annotate swept sine data in the same display as random data. In addition to importing data, DataExplorer allows export of data via "cut and paste" into spreadsheet programs. The Transducer Database is a productivity tool that assists in the storage and organization of transducers and equipment used in the test laboratory. This package consists of a standalone application, Transducer DB, and integrated functionality within the Puma software programs. Transducer DB allows the user to enter the following information for each of their transducers: Serial Number, Direction, Transducer Type, Sensitivity (mv/EU), Units, dB Reference, Manufacturer, Model, Cal Date, Cal Expiration Date, Prior Cal, Cal Type, Cal Level, and ICP Coupling. 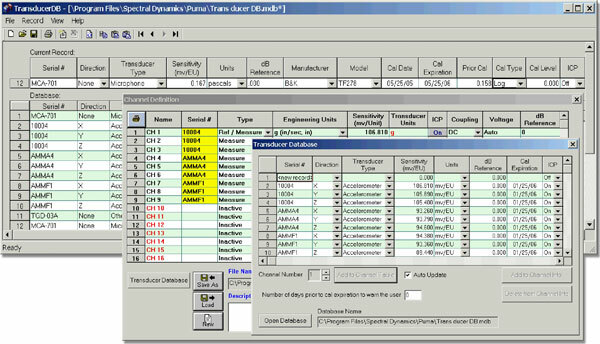 Within any of the Puma test or acquisition software packages, one can access the transducer database when setting up channel parameters for the test. Whenever the test setup is recalled, the Transducer DB will verify that the transducer calibration has not expired. In addition, if any calibrations have been performed since the setup was entered, it will update the sensitivity. Another great feature of this package is the Find and Replace function. This feature will allow the user to find and replace a transducer (and its related parameters) in selected test setups. The Transducer DB was designed to help increase the productivity of the Lab by reducing test setup times and monitoring transducer calibration for improved quality control. Database Manager is a utility that allows the user to connect test information with frames of an Spectral Dynamics Data file and assist in the organization of your test data. Using Database Manager stand alone allows you to create, modify, and query a Microsoft Access database. Once the database is setup, you can control Database Manager through the Puma Test Settings Dialog. selection in the graphics menu and can be displayed with live data channels during the test.The input and output data sources are completely configurable and can operate on internal data, data files, or live data. Puma Export Manager is a utility used to convert data files to different file formats for viewing and importing between Puma and other applications. Supported conversions include text files (ASCII) and Universal File Format (UFF).